Ganesh is the destroyer of evil and obstacle as well as Lord of success. Ganesh is worshipped as the god of education, wisdom, knowledge and wealth. Ganesha is considered as one of the 5 prime Hindu deities as the other four are Brahma, Vishnu, Shiva and Durga. Ganesha is glorified as panchayatana puja and of course everyone knows that Ganesh as a remover of obstacles. Go further to know Lord Ganesha Drawing step by step. Ganesh’s mother Parvati was hanging out at Shiva’s mountain home one day. Parvati tried to go visit her husband but she was blocked by the head attendant of Shiva called as Nandi. Shiva was on deep meditations again and he does not like to be disturbed. Parvati was deeply hurt and felt very lonely as ignored by her husband. She made a decision to have someone to be with her anytime to respond to her. Then collected some clay from ground and molded a handsome young man and she breathed life into him then handsome Ganesh was born. Ganesh always had an elephant head and it gives a unique look for him. When you like to draw lord Ganesh then it is necessary to know about the techniques so that it would be quite easier for getting a good image. You just need pencil and paper to start drawing Lord Ganesha. Moreover, In previous articles, we explained about Lord Shiva Drawing as well. Get ready for to draw Ganesha and Start by drawing with the medium sized circle right in the middle of your page as well as towards its top. Bigger circle below the first one for body and Keep little gap to the head. Draw it as the petal like formation with the small dot towards the end. Draw the horizontal oval overlapping it the body and then draw the leg for getting the outline in the absolute manner. Draw ovals for the head and the elephant ear so you can easily draw the remaining parts of the body as shown in the diagram. Make his eyebrows and Make an earring on the right one. Now you can easily draw a line gap between the two circles. Draw 2 slightly curved lines on either side and then you can easily join the line you drew before to body. Make use of the dot to draw the similar oval on its right and then you can erase the dotted lines. Draw the Lord Ganesha’s other arm with showing the blessing. Draw Lord Ganesha’s arm and hand on left so that it would be quite easier for drawing the rest. Draw a semi circular line from the arm, to the face then end above the right side oval. Now it is necessary to draw the pillow and other accessories. You have room to draw his necklace and then draw a small semicircle and a bigger one below. Draw the top of his dhoti and then belt shaped towards the bottom. Draw his toes and then his face. Draw a round shape in the bottom part and extend it trunk shape. Draw the of the face and jewels as shown around the figure for his throne. Erase lines as shown and folds in his trunk. Draw dotted line across the top part and then color it. Make a turban and you can also add a white touch to make it look real. 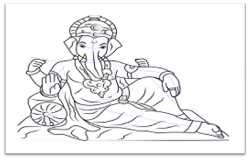 I hope you like reading an article on “ How to draw Ganesha drawing cartoon step by step”.